Effective design is at the heart of everything from software development to engineering to architecture. But what do we really know about the design process? What leads to effective, elegant designs - and what doesn't? In The Design of Design , the legendary Fred Brooks takes on these questions - and does for design what his classic best-seller The Mythical Man-Month did for project management. In a series of essays reminiscent of the approach he took in The Mythical Man-Month , Brooks illuminates hidden issues that designers face in every discipline, and uncovers processes and patterns most likely to lead to excellence. In his first major book in more than three decades, Brooks addresses the design process as it has evolved today -- including new issues and opportunities that accompany team-based and distributed design of complex systems. 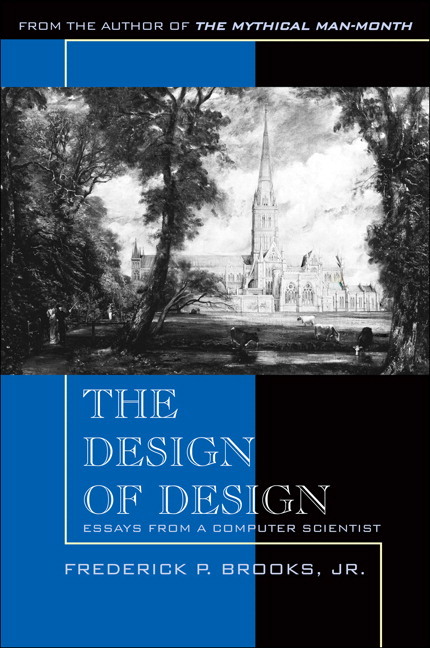 Drawing on the experiences and intuitions of dozens of exceptional designers, Brooks argues convincingly that better outcomes now require bolder design decisions. Brooks shares new important insights about constraints, budgets, design empiricism, aesthetics and style, tools, and more - including two powerful essays on what makes designers great, and where great designers come from. The book concludes with six case study "trips" through design spaces ranging from beach houses to IBM's Operating System/360 - the project that made Brooks famous some four decades ago. Frederick P. Brooks, Jr., is Kenan Professor of Computer Science at the University of North Carolina at Chapel Hill. He is the recipient of the National Medal of Technology, for his work on IBM’s Operating System/360, and the A. M. Turing Award, for his “landmark contributions to computer architecture, operating systems, and software engineering.” He is the author of the best-selling book The Mythical Man-Month, Anniversary Edition (Addison-Wesley, 1995).